A view into the restaurant and it's new marble bar/counter. Oakland: Here we have the state of affairs at the shuttered Di Bartolo, which is in the process of being reborn at Charlie Hallowell's follow-up to Pizzaiolo. Looking at the space itself, it's not hard to see how Hallowell was wooed by the prospects of a small neighborhood joint: there's room for live music, exposed brick walls, a marble counter overlooking a small open kitchen and so on and so forth. 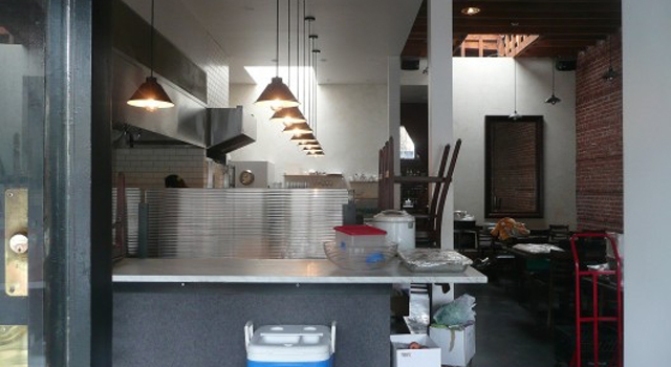 The restaurant will be the second Pizzaiolo in Oakland. The original one, on Telegraph Avenue, has been recognized by San Francisco Magazine as one of the 50 best restaurants in the Bay Area. Sources at the place say that the upcoming pizza place is likely still several months away, but given that hiring is well underway, a debut could be closer.